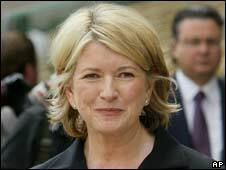 American lifestyle guru Martha Stewart has been refused a visa to enter Britain because of her convictions in the US, according to reports. The millionaire, aged 66, served five months in a US jail in 2004 for lying to investigators about a share sale. Her spokesman said she hoped the matter could be "resolved". The UK Border Agency would not comment specifically, but said it opposed the entry to the UK of anyone convicted of "serious criminal offences abroad". Ms Stewart had been due to visit the Royal Academy of Arts in London, as well as carrying out a number of other engagements. The Academy said it understood a series of informal meetings and a tour had been planned, but it was unaware the visit had subsequently been cancelled. Ms Stewart amassed a fortune from books, magazines and television programmes giving lifestyle advice on topics as diverse as cooking, gardening, decor and weddings. Her spokeswoman told the Daily Telegraph newspaper: "Martha loves England and hopes this can be resolved and that she will be able to visit soon."